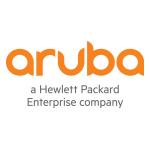 SANTA CLARA, Calif.--(BUSINESS WIRE)--Aruba, a Hewlett Packard Enterprise company (NYSE: HPE), today announced that Liberty University, the largest university in Virginia, has completed a significant expansion of its Williams Stadium using Aruba wireless, security and network management solutions. The massive upgrade, which was completed in less than one year, is already delivering fast and reliable connectivity to bring fans and event attendees an exceptional mobile experience. 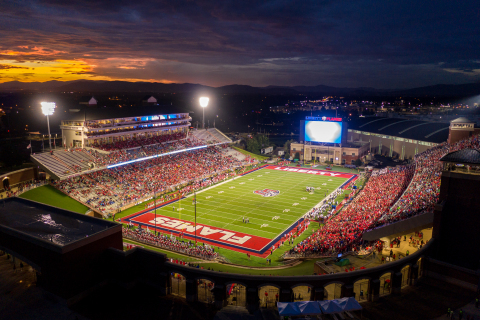 In preparation for its new NCAA Division 1 (D-1) football classification, the Liberty IT team knew they needed to upgrade Williams Stadium to accommodate the minimum levels of seating and attendance required by the NCAA and to provide a rich and engaging fan experience. Additionally, IT needed to address event attendees’ complaints about a lack of Wi-Fi in the school’s large public venues – particularly the stadium and other athletic arenas. After conducting a Proof of Concept with several vendors, Liberty chose Aruba for the new stadium infrastructure and MS Benbow and Associates for construction and engineering. Using a mixture of Aruba Access Points, as well as Aruba ClearPass for Network Access Control (NAC) and guest access services, and AirWave to deliver a single pane of glass to monitor and manage the network, Liberty can now support an expected 25,000 devices in the stadium. 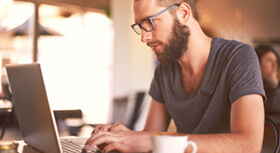 The new infrastructure and Aruba software will enable the use of key applications such as HD video streaming and Wi-Fi calling in a highly dense environment. At Liberty’s first home football game of the season, the IT team measured take rates of 38% among the 20,000+ attendees in Williams Stadium with more than 10,000 unique devices connecting to the network. Those connecting to the Wi-Fi experienced average network speeds of 70-100Mbps down/up, while the wireless network as a whole peaked at 1.2 Gbps down, and 770 up, with nearly a terabyte of total data used. A key factor in Liberty’s decision was Aruba’s multivendor capabilities. While the University was already an Aruba wireless campus, they also have other vendors’ switches in place, so Aruba’s ability to seamlessly interoperate with these products was key. Liberty was also impressed with the benefits of ArubaOS 8, including AirMatch for automated RF management, and Live Upgrade, which allows the entire network to be updated in real time without taking the network down. Norton noted, “We’ve played with a lot of algorithms in the industry and so far, I haven’t seen one that works as well as AirMatch for RF management, dynamic channel utilization and channel planning.” He also noted that previously, making a change to the network could take an engineer four to eight hours between configuration changes, validation testing and actual deployment, so Live Upgrade saves the IT team a great deal of time, allowing them to focus on more strategic initiatives. 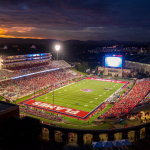 Because Williams Stadium is used for a variety of events, such as Liberty’s commencement ceremony, the opening ceremonies for the Commonwealth Games that Liberty hosts, and special events like drone racing, it was critical that the new network be ready to support all of them. With ClearPass, Liberty can set up and manage secure access for all of these events and stakeholders, including the various vendors that take part in them. In the future, Liberty plans to expand the network infrastructure to provide the same experiences in all eleven of its large public venues around campus including the baseball and softball fields, indoor track facility and natatorium. Norton says they will also evaluate Aruba’s location services portfolio as they look to enhance their current campus app with the athletic venues’ information, adding new features that will enhance the fan experience further.